Serve on its own or with a sauce, like custard or salted caramel sauce. Enjoy! This looks absolutely delicious. I like that you just throw all the ingredients together and half an hour later you have yummy (and healthy) ginger cake! That’s the part I love too. A simple healthy recipe that tastes as good as it looks and doesn’t take too long to prepare. Nothing complicated. I don’t do complicated well. I don’t do complicated either Ilana, but I do Ginger Cake very well. Looks tasty! Thanks Tim. Yes, I am partial to ginger, in a cake even better! I like that it’s not as heavy as non-gluten cake, and that it still has all the taste. I’m pleased you like the recipe. Looks fab will have to give it a try! Thanks. Yes, we’d love you to come back and let us know your thoughts, when you’ve given it a try. 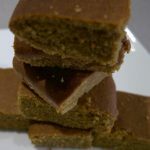 Ginger cake is my favourite of all cakes and this recipe looks especially good. I do like that it is healthier than other recipes I have seen so I will most definitely give this one a try. Thanks Ian. We’d love you to come back and let us know how you get on with this recipe, or any other recipes you’ve tried from the site.